Tsunokichi is located in a small alley off Gojo Dori, the avenue that leads to Kiyomizu-dera Temple. It sells food products like sansho-jyako (dried baby fish fry that has been boiled in sansho pepper and soy sauce)— which tastes great eaten with white rice—and tsukudani (fish or meat dishes that have been simmered and reduced in soy sauce, mirin and sugar). Food products sold at Tsunokichi do not contain any additives or chemically-based seasonings. The shop makes the most of the flavor of the ingredients it uses while also working out ways to avoid polluting the environment of the world we live in. 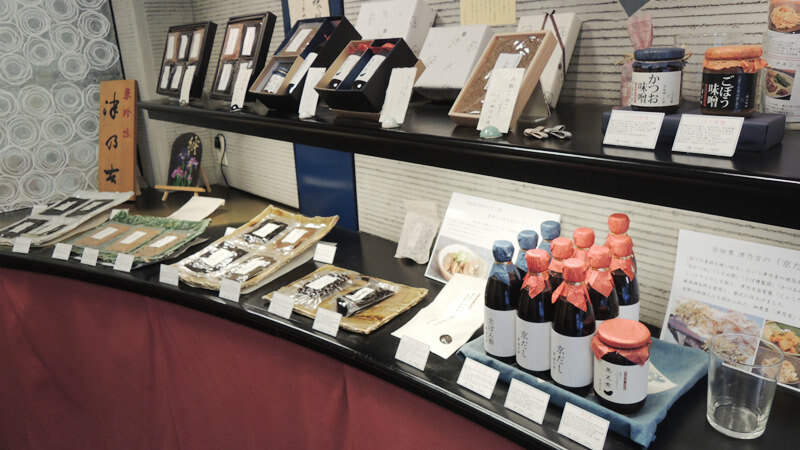 All Tsunokichi products are handmade and make good use of the dashi stock they are cooked with. They are all products that you will love to use when eating or cooking Japanese dishes. The shop stocks not only food products used in Japanese cuisine, but also ingredients such as pasta, which are used in Western cooking. Many of the products on sale can be stored for a long time, which makes them good for souvenirs. This shansho-jyako has a light, elegant taste with the flavors of the dashi stock coming through nicely. The texture is soft. The sansho pepper’s piquancy adds a spicy accent. The richly umami-flavored dashi that is created when this shansho-jyako is used by Tsunokichi as a base for making other food products. An all-purpose seasoning with a soy sauce base. Kyo-dashi combines bonito, soy sauce, and the dashi stock created when making sansho-jyako. Its soy sauce and dashi flavors are what make this product so appealing. It is great for cooking Japanese dishes, of course, but we also think that adding some to pasta or Chinese dishes will help boost their umami flavors. A salty-sweet product created using three different types of bonito and miso. You will enjoy its subtle sweetness more so than any saltiness. The flavor of this miso is a tad on the strong side, so we feel this is a good product eaten on top of white rice or added to stir fries. Your favorite products can be purchased in combination. Boxes for gift sets for certain products are also available. This is a restaurant specializing in stews located a bit hidden away on a small alley. It is best known for its whitebait, or shirasu, which go perfectly with white rice. The shop also generously offers food tasting to visitors. They have jams made from vegetables and also one made from plum liqueur, which makes a delicious wine snack with biscuits and cheese. I recommend the katsuobushi miso soup, which can be had with either rice or vegetables! 2-minute walk from Keihan Line Kiyomizu Gojo Stn. The shop is small and does not have many shop assistants. When visiting in a group, please wait your turn to make your purchases.